What they grow: Over 25 varieties of hommus, made fresh from California grown garbanzo beans and farmers market produce. Each batch of hommus uses ingredients sourced from local San Luis Obispo County Certified Farmers Market growers. Top sellers include Avocado and Cilantro, Za’tar (a Mediterranean blend of sumac, sesame seeds, and thyme), and Sundried Tomato and Basil. Where to buy: Farmers markets including Tuesday in downtown Santa Barbara, Wednesday in Solvang, Saturday in downtown Santa Barbara, and Sunday in Goleta. 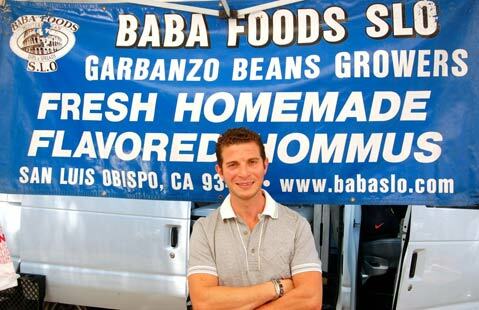 In season now: In addition to their extensive selection of hommus, Baba Foods SLO also sells fresh and dried garbanzo beans (depending on harvest schedule). Always open to new flavors and suggestions, Baba Foods SLO is hoping to release a zesty lemon and artichoke/kalamata olive in the near future (as well as salad dressing!). Their story: Hailing from Tunis, Tunisia, Bensalem was eager to make food that mirrored the freshness and quality found in his home country. In starting the company fifteen years ago with his brother and cousin, he was excited to bring back the flavor of his homeland. Growing two tons of beans yearly, Baba Foods SLO is dedicated to quality control and consistency, while also creating a product void of sprays and fertilizers. Knowing how the bean is processed was a huge factor in the company growing their two-acre garbanzo crop for hommus production. Processing everything in a commercial kitchen in San Luis Obispo, the company originally started with three flavors (Classic, Roasted Sweet Bell Pepper, Baba Ghanouj) and has since expanded to add Asian, Indian, and Southwestern flavors to the mix (Ginger Wasabi, Vegan Curry, and Chipotle). And the secret to their creamy hommus? Keeping the beans cold before processing! A familiar face at the markets, Bensalem has enjoyed the friendships he has made with customers and growers alike, managing the SLO Certified Farmers Market. With a thriving business, the company hopes to expand their retail locations to Whole Foods and other more localized markets. Nevertheless, they will always remain loyal to their customers at the markets, the foundation for their continued success.